The 10th canto in Srimad Bhagavatam is known as “Ashrayam” or “refuge” for Lord Krishna’s devotees for it talks about the Lord’s incarnation and his sweet lilas on this Earth. 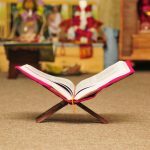 Sri Swamiji has written beautiful kirtans on these various lilas of Lord Krishna. So, in this series we will relish those lilas of Lord Krishna through Sri Swamiji’s kirtans. The last couple of months we saw how Mother Earth prayed to relieve her burden and we saw Goddess Durga’s kainkaryam (service) to the Lord and how she came to be known as the Lord’s sister. After Goddess Durga transferred Adi Sesha (Balarama) to the womb of Rohini Devi and she herself resided in Mother Yashoda’s womb, the time for the Lord’s arrival began to near. Therefore, the Lord – who is beyond birth and death and is ever-free – constrained Himself into the womb of Devaki and settled there. We bow down to the embodiment of Truth! It was now time for the Lord’s descent! 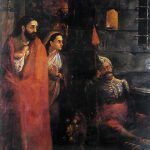 Sri Shuka begins – “atha sarva guNopeta: kAla parama shobhana….”. When the master comes, everybody under him is in their best behavior, similarly, when the Lord of the Universe descended, everything in this universe was at its best – the planets aligned themselves to favorable positions, the time became auspicious, rivers were flowing gently and there was a pleasant fragrant-filled breeze. Everybody in all the three worlds rejoiced and awaited the moment! As the entire universe watched, Bhagavan emerged on that dark night just as the moon rises in the East and fills the night with light! In the darkness of the night, the Lord of the Universe, the One who is hidden inside everyone, appeared from Devaki, just as a full moon appears in the eastern horizon. Sri Shuka here beautifully compares Devaki to the eastern horizon. Though the moon appears to come from the eastern horizon, yet it does not mean the eastern horizon gave birth to the moon or it was in any way responsible for the ascent of the moon. 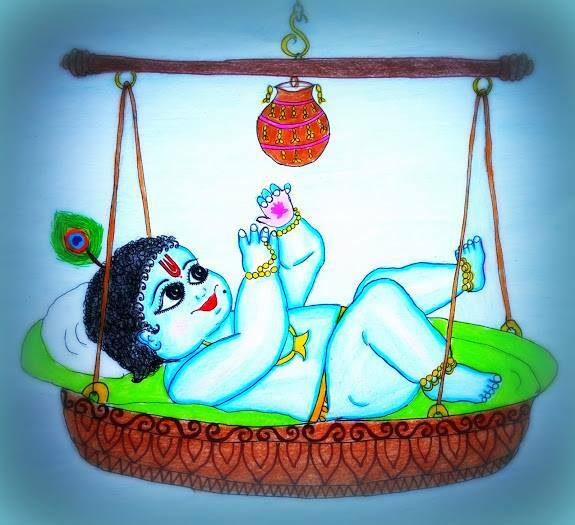 Similarly, even though the Lord resided in Devaki’s womb, he did not go through the birthing process like a normal jiva (soul). When the time was right, the Lord just appeared. In the next sloka, Sri Shuka describes this beautiful form of the Lord that His father Vasudeva beheld. Vasudeva beheld That wonderful Child with lotus eyes, carrying the divine conch, disc, mace (and a lotus) in each of his four hands, wearing a yellow silk cloth that contrasted against His dark hue, adorned with the Srivatsa mark, the Kaustubha gem, a brilliant crown, earrings, belt, armlets, bangles and other ornaments. As Vasudeva and Devaki watched, the Divine Child spoke to them and reminded them about their penance and their previous births, blessed them and gave them instructions. When a child is born, it is said the parents get bound by maya (the Lord’s deluding power) further because they laugh when the child laughs, they are sad if it is sad. 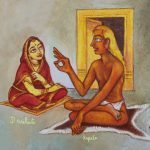 But there at that juncture, both the father Vasudeva and mother Devaki performed beautiful stutis (praises) of Bhagavan, extolling His nirguna (formless) aspect. This shows how the Lord had bestowed them with Jnana (divine wisdom and knowledge). 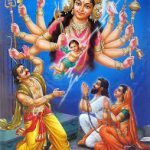 But in the end, Devaki does reveal her mother’s heart and requests Bhagavan to give up His divine form with four hands and instead assume the form of a normal human baby. Sri Swamiji describes this beautiful episode of the birth of the Lord through his Tamil song- “Avadarittan Kannan” in the Raga Vasanta. The lyrics and meaning are presented below.